Kris Saunders-Stowe who runs Wheely Good Fitness and is a group exercise instructor for Halo leisure is one of the stars of Channel 4’s new Paralympics TV commercial. Marking the launch of Channel 4’s Superhumans campaign with the Sammy Davis Jr hit Yes, I Can, Kris shares with us his story on dance and how it’s important to focus on what disabled people can achieve. My parents always encouraged me to try new things as I was growing up. I was always a very energetic child and had a passion for music and dance. At the age of seven, I attended my first dance lesson in ballroom and Latin American dance. I was hooked instantly and progressed through all the levels to ‘gold bar’. My dance teacher felt I had potential and discussed with my mother her wishes to coach me to become a professional dancer. This was very exciting for me but sadly outside the studio things were not as positive. My Mother, proud of my achievements as many parents are, sent my medals and certificates to school with me. I’d be called up on stage in assembly each time to share my achievements. Whilst the intention was good this resulted in me being picked on at school and slowly it escalated to bullying, kicking, punching and I became the odd one out. As anyone who has experienced bullying as a child knows it is not an easy thing to manage and it changes you, the way you see yourself and your abilities and how you socialise. I wanted it to stop and, in the simple way we see things at that age, I felt if I gave up dance it would all stop and go back to normal. So I told my Mother I didn’t like it any more, at my next dance lesson she advised the school of my decision and they tried to talk me out of it but I insisted and it came to an end – the bullying didn’t and was set to last for the rest of my school life. I’ve often wondered what my life would be like if I’d carried on dancing and contemplated returning to dance, but as my health deteriorated and I lost most of the function in my legs due to a degenerative condition the idea of dancing again faded away. When I started using a wheelchair it felt like I was taking back control and regaining my independence. I became a fitness instructor and started Wheely Good Fitness, specialising in multi-ability classes and I was able to enjoy music and rhythm again through teaching aerobics. Amongst other fitness qualifications I learnt wheelchair dance and qualified as a wheelchair dance instructor through the Wheelchair Dance Sport Association. My work has taken me to many places, speaking at the European Conference in Dublin, presenting at Westminster Hall and other venues, a guest speaker with Paralympians David Weir and Sophie Christiansen, TV work and a visit to Downing Street. All demonstrating that a disability does not have to stop you from achieving in life. 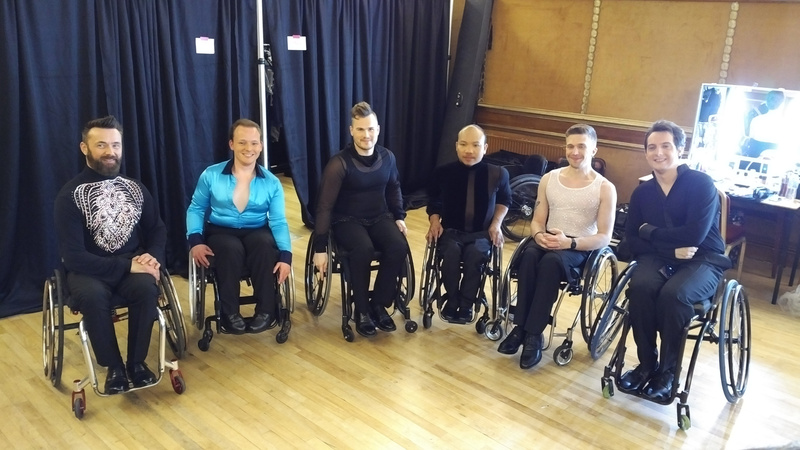 But this was not to be the end of my dance story because a few months ago I received an email inviting me to audition for a part in a commercial as a wheelchair dancer. I of course said yes, the chance to not only be involved in a commercial but to also dance ‘professionally’ is an opportunity not to be missed. Finding out after the auditions that I had been chosen to dance and chosen as part of Channel 4’s Paralympics commercial was fantastic. This has reignited my passion to dance and opened up many avenues in which to do so. The irony for me is that I have gone full circle, as a kid I wanted to dance but bullying stopped me, when as an adult I felt I ‘couldn’t’ dance because I of my disability – now I can dance because of and for disability. Working on the commercial has been a great experience for me, meeting many new friends and sharing something special and iconic together. There was a great mixture of personalities and I think we got on really well together and all had something unique to offer. The rehearsing and even the shoot is very repetitive and time consuming to fine tune every move, expression, location and so you certainly work having to almost switch from relaxed mode to ‘performer’ mode in a click. But I think that’s what adds the enjoyment of it all, the constant striving to be better each time and to do your best. The 2012 commercial which was created by the same director was dynamic and punchy as is this year’s and managed to get across the passion, drive and commitment of those taking part in the paralympics. How this one I think differs is that it features a wider range of disability sports and also sends a simple message to everyone who thinks they can’t do something with the ‘Yes I can’. I think it’s human nature to pigeon hole people based on what we see at first glance. Disability comes in so many shapes and forms, visible and invisible, that no one person can be considered the same. The same can be said for people who do not live with a disability, because we are all the same by the very fact that we are all uniquely different. So many people look at the disability, at what they ‘think’ someone can’t do rather than see what they can do. We are all unable to do something in life but we are also all capable of doing something and it is what we can do that is important and can lead us forward in life. 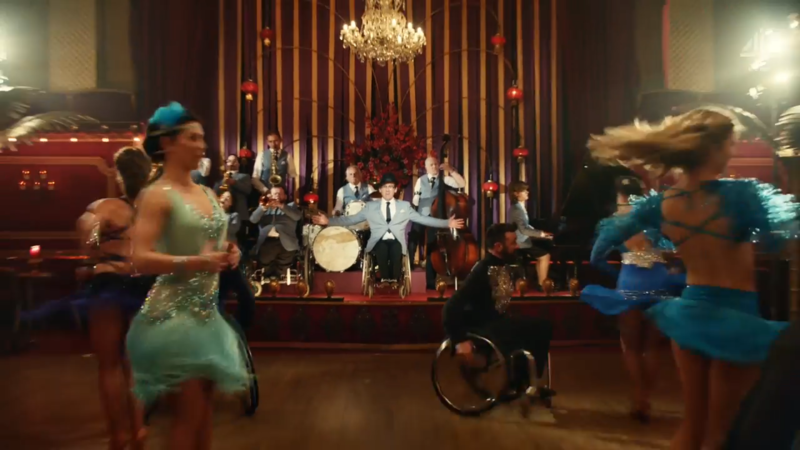 This is one of the things I like about the the new commercial: it shows what people are capable of not just on a paralympian level but as ordinary people taking part in activities that lead to a healthier, enjoyable and more independent life. The paralympics shows what you could achieve if you that is your dream but I think it also shows that in all areas of life you can do anything if you believe in yourself. 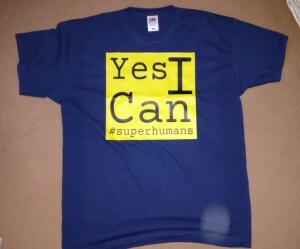 The statement ‘Yes I Can’ is a powerful one and Kris designed a t-shirt for himself that shared this bold statement with others. The ‘Yes I Can’ statement has resonated with many people and we have been asked by several of them where they could obtain the shirt and so we have decided to make it available to buy. The shirt is available in 7 different colours and the price covers the cost of the shirt, printing and postage with no mark up. If you are interested in the shirts please visit our shopping page here.